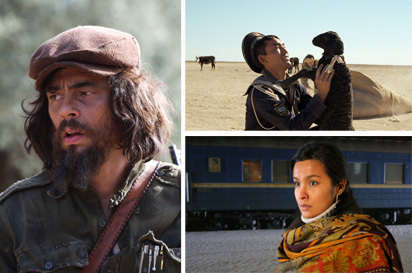 Discussion about Steven Soderbergh’s Che, among the more anticipated titles in this year’s New York Film Festival, is bound to dwell on its running time. Four and a half hours bifurcated by an intermission, Che is really two separate, self-contained films on the same subject. The first half covers Ernesto “Che” Guevara’s leadership role during the triumphant Cuban revolution; the second details his ill-fated attempt to lead a peasant revolt in Bolivia. The distributor, IFC Films, plans a short Oscar-eligibility run of the entire film in December followed by a traveling show in 2009 in which each half will screen separately. Measured by the half or as a whole, Che is a lot of movie. Yet many have already complained about what’s not included, from biographical backstory to Che’s time between the revolutions serving as a minister in Fidel Castro’s Cuban government. Problematic as portrait, the film fascinates as a mess of artistic choices — some bold, some easy, many good in theory if not in effect. In the film’s first half, Soderbergh frequently steers away from moments of drama or catharsis. Guevara (Benicio Del Toro) and Castro sail to Cuba to start their revolution, but we never see them land; they build to battles but we rarely see them fight. Soderbergh either jumps ahead or shuffles to the side, dwelling on process, anticipation, and vague philosophy, yet rarely alighting on insight or visual distinction. Meanwhile, Soderbegh interweaves a black-and-white, cinema verité flash-forward of Guevara’s 1964 United Nations visit — a major misstep that counteracts sober jungle-set revolutionary procedurals with pot-shots on capitalist urbanity — and allows an evasive interview with a radio reporter (distractingly voiced by an affected Julia Ormond) to provide the film’s historical and even emotional context. The Cuban half resolves with a masterfully plotted siege, finally providing release — for audience and filmmaker alike — in the form of old-fashioned gunplay, ambushes, and badass heroism. More controlled, contained and effectively plotted, the Bolivian half benefits from the tragic inevitability of Che’s guerrilla campaign. Deftly co-opting war and western tropes, the film arrives at a Herzogian end, with our fearless leader driven forward and then trapped by his crazy conviction. Still a fashionable enigma — and this is still a “great man” view of history — but Soderbergh at least adds dark, strange shadings to the Guevara icon. A domestic return for writer-director Olivier Assayas after a trinity of films — demonlover, Clean and Boarding Gate — explored webs of international intrigue and commodity exchange, Summer Hours nevertheless reflects the filmmaker’s continued interest in the way that contemporary relations evolve with the expanding global economy. When a family matriarch dies, leaving behind an idyllic country house and a gallery’s worth of valuable art and antiques, three siblings are left to negotiate matters of nostalgia and profit. While Frederic (Charles Berling) wants to preserve the family legacy, keeping the collection and the summer cottage, his sister and brother aren’t so sure. Adrienne (Juliette Binoche) is a designer who lives in New York and is set to marry and remain in America. Jeremie (Jeremie Renier) works for a sneaker company that has relocated him to China, where he and his young family are destined to settle. They both could use the money, and neither has any use for the house or family heirlooms. Frederic views tradition through tangible objects and familiar spaces, but he finds that values and even the conception of family have been subtly but utterly redefined by the new parameters of modern life. Avoiding easy conflict and histrionics, Summer Hours instead shows loving siblings, relatives and friends negotiating differences the best that they can. There are no easy or right answers, just honest, flawed ones. With the help of cinematographer Eric Gautier, Assayas moves through space and time with a fluidity that at first feels light but grows heavier from accumulated detail and from the heightened, tragic sense that what we see before us is changing, and indeed may be gone before we understand it to be worth saving, loving, or remembering. Looking past the requisite pile of American prestige pictures such as Che, Clint Eastwood’s Changeling and Darren Aronofsky’s The Wrestler (and past the latest works by established European auteurs), the great revelations of this year’s New York Film Festival are not one but two films from Kazakhstan. Immediately complicating attempts to essentialize or generalize, Chouga and Tulpan have divergent styles, narratives and milieus; the Kazakhstan of one exists only as far-off fantasy in the other. An adaptation of Tolstoy’s Anna Karenina transposed to contemporary Kazakhstan, Chouga is a masterful distillation of the great novel’s characterizations and themes. In constant dialogue with the nineteenth century text yet immersed in the bourgeois urbanity of a post-Soviet society on the rise, Chouga shows how patriarchy persists in permitting male passions and is intolerant of women’s. Writer-director Darezhan Omirbaev gives a crash course in economical storytelling, minimizing dialogue while winnowing down to select shots and sounds: quick glances and long looks; the tilt of a head and slope of shoulders; flashing casino lights and conspicuous flat-screens; doors clicking closed and heels clacking across a lobby floor. As the title character, Ainur Turgambaeva has an exotic, enigmatic reserve that emanates both power and subjugation. Draped in class, her matronly scarves are yet bright orange flares for attention. Her face is calm but never demure, and her gaze is long, serving as salvation but sealing her fate. Looking out windows and across rooms, she scans for something more or better — and then, when something is found, she dares to take it in. Broad-shouldered, big-hearted, covering endless earth under a giant sky — forget about slice of life, Tulpan is the whole pie. Asa (Tulepbergen Balsakalov) is a young man recently returned from the navy. He dreams of a simple life on the steppes, with sheep of his own to shepherd, a yurt to call home, and a beautiful wife at his side. Except he knows nothing about herding, and the only unmarried girl in the area isn’t interested. He lives with his young sister, her imposing husband, and their three children in a single, circular, canvas-covered yurt, by day learning how to wrangle, skin and care for sheep and by night dreaming of a girl, Tulpan, that he’s never even seen. Mindful of the hard life of herding, his brother-in-law refuses to give Asa a flock of his own until he has a wife to cook and care for him. Out of options and no closer to his dream, he threatens to run off to the city with his tractor-driving friend. Rather than strand figures in the vast landscape, director Sergei Dvortsevoy gives his characters big personalities with which to fill it. Using mobile long takes and capturing every swooshing, crashing, braying sound, he conveys a complete spectrum of life on the steppe: the extreme challenges of herding amidst sandstorms and sparse vegetation; the loneliness of a young wife with only small children to keep her company; the boredom of a curious boy; the infinite adventure afforded a toddler; the pain of a pregnant sheep; the agitation of a camel. When Asa single-handedly births a calf — on camera, uncut — summoning courage and stifling gags as the mother sheep moans for relief, Tulpan pushes beyond joyous and thrilling and into the realm of the miraculous. From beginning to end, horizon to horizon, Dvortsevoy’s film is simply a privilege to watch.